JERUSALEM – World Jewish Congress President Ronald Lauder has conveyed his gratitude to Bulgarian Prime Minister Boyko Borisov for all he has done and continues to do to address the needs and concerns of the Jewish community in Bulgaria, in a letter hand-delivered on Wednesday by representatives of the WJC to the prime minister on his official visit to Israel. In the letter, Lauder wrote: “Your strong support for Israel sets a shining example for other countries to emulate. My colleagues and I are especially appreciative of your efforts to prevent Sofia from being used by neo-Nazi groups to manifest a message of hate and xenophobia, which is totally contrary to Bulgaria’s long and inspiring tradition of religious tolerance and respect. "World Jewry will always see Bulgaria as a light that pierced the darkness during the terrible years of the Holocaust, which claimed the lives of so many Jews across the length and breadth of Europe. Bulgaria was one of the few countries to act with tremendous moral courage, and for that, the Jewish people, worldwide, are eternally grateful. In keeping with that sentiment, and as a reminder of the warm relations between Israel and Bulgaria, the representatives of the WJC presented the Prime Minister with a Chanukiah (menorah) as a token of his appreciation. 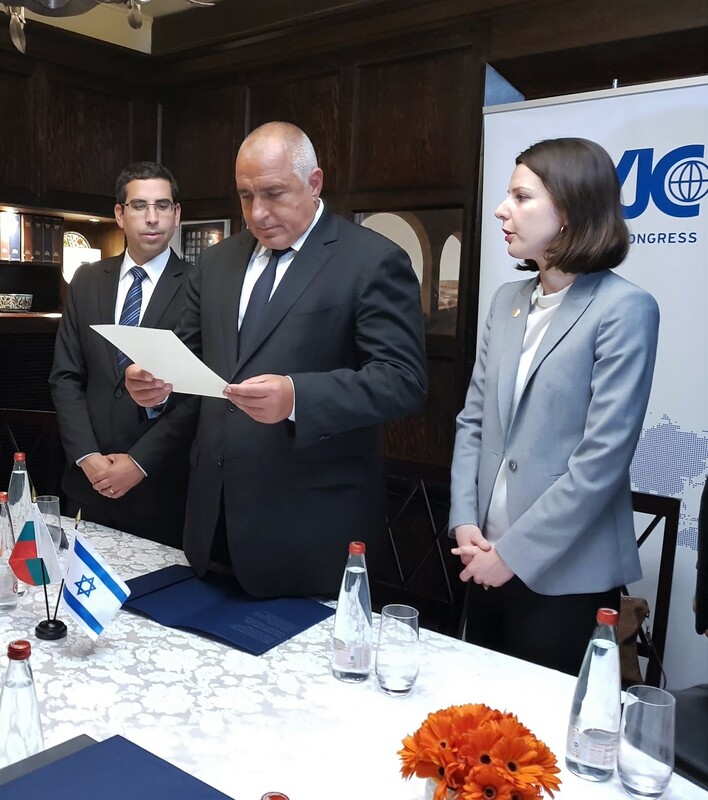 Prime Minister Borisov was accompanied to the meeting with the WJC by a large delegation, including Dr. Alexander Oscar, President of the Shalom Organization of Jews in Bulgarua and the mayor of Sofia, Yordanka Asenova Fandakova. The WJC was represented by WJC-Israel Executive Member Sahar Pinto and by Dr. Laurence Weinbaum, National Director of the Israeli branch of the WJC.